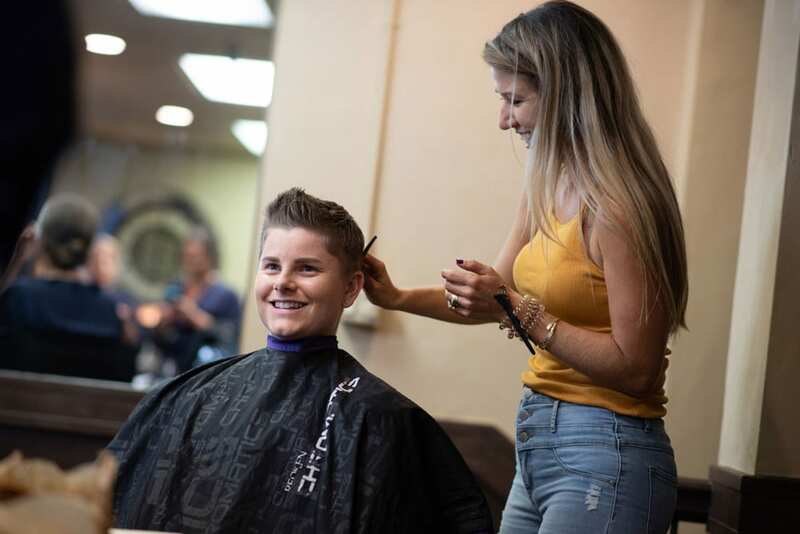 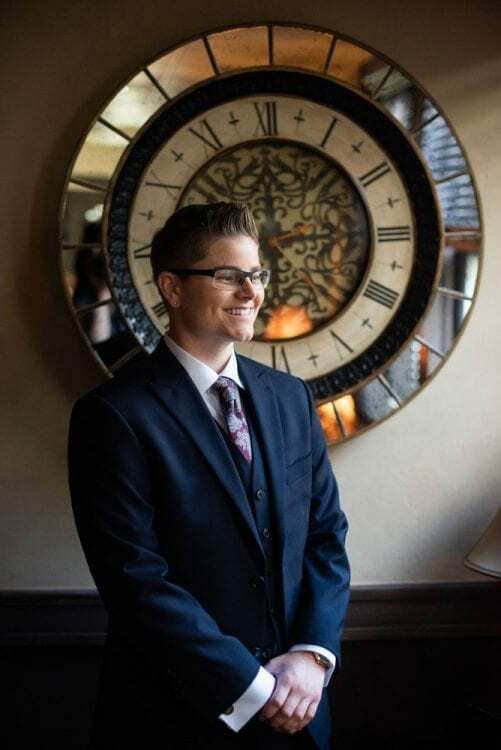 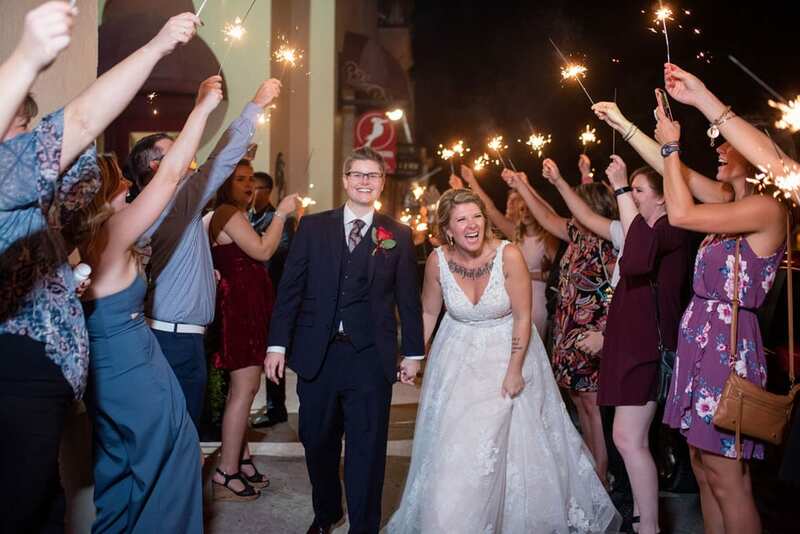 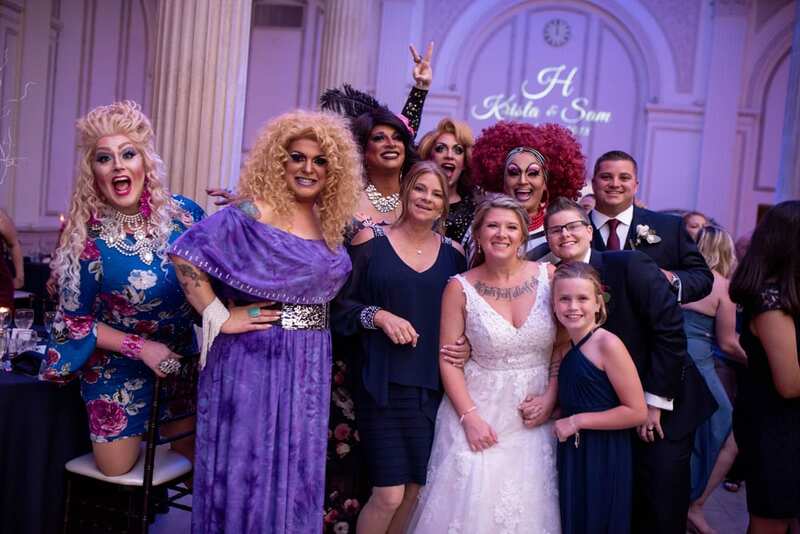 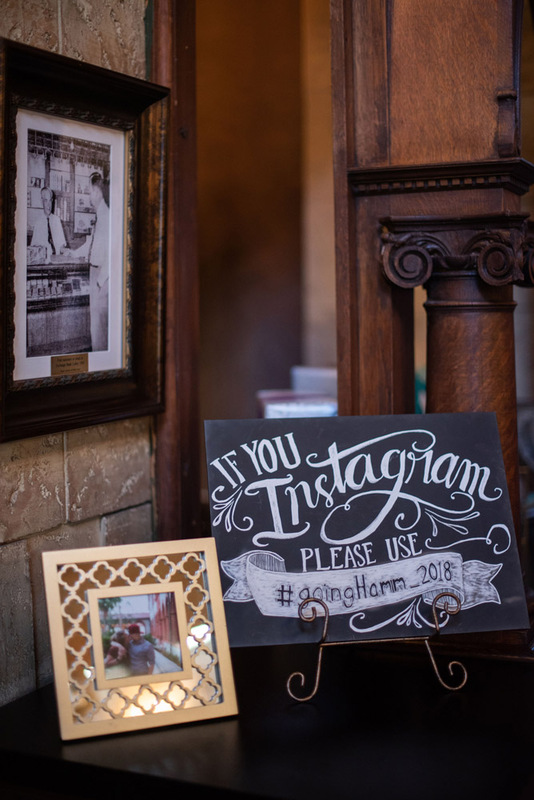 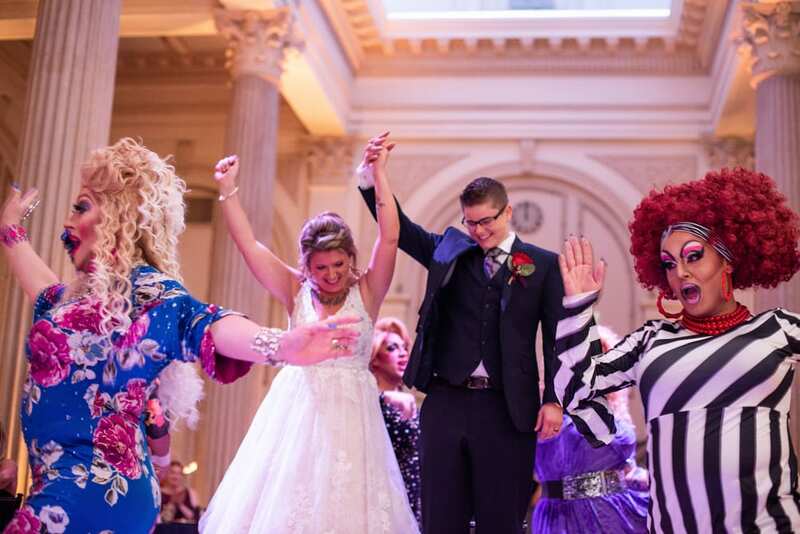 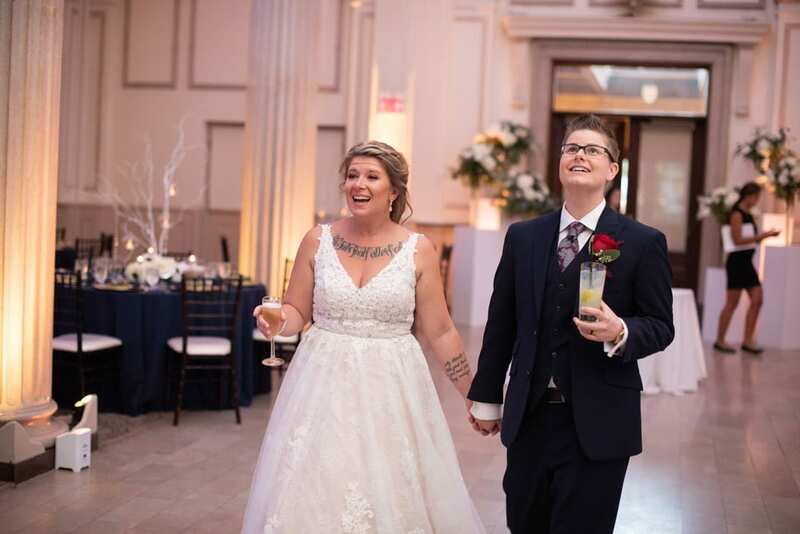 We are so excited to take a look back at Samantha and Krista’s wedding day this past October–our first LGBTQ wedding at The Treasury on the Plaza! 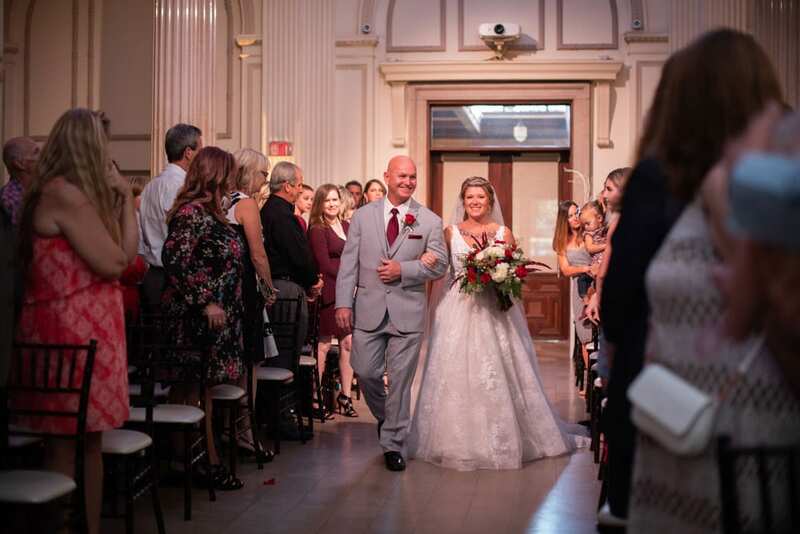 You are going to fall in love, not just with this sweet couple, but with all of the incredible details from their big day. 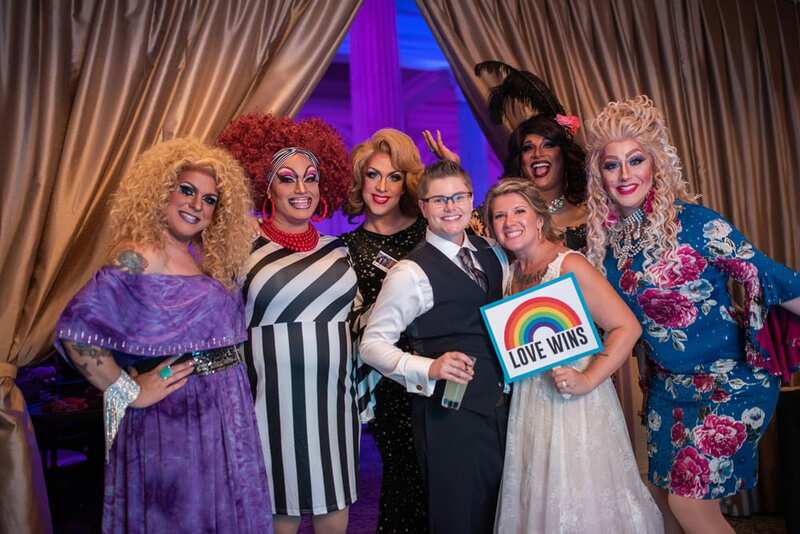 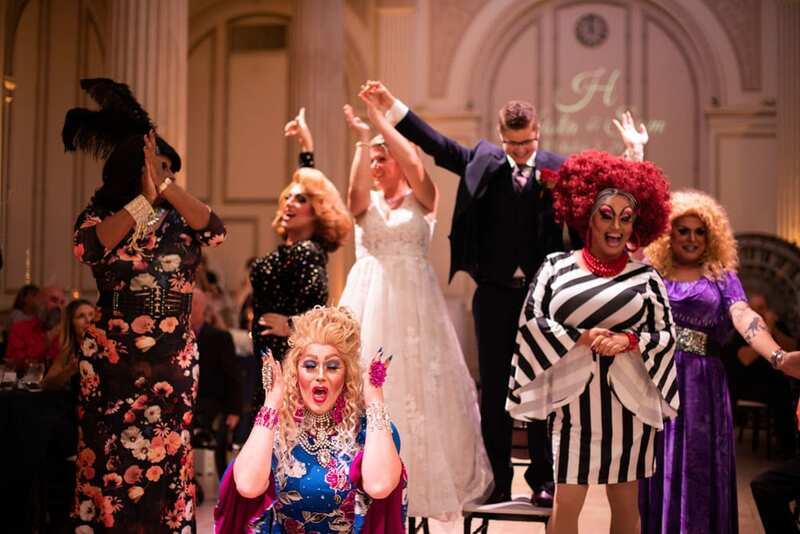 Sarah Annay Photography was on hand to capture all of the love, joy, and did we mention the incredible drag show?!? 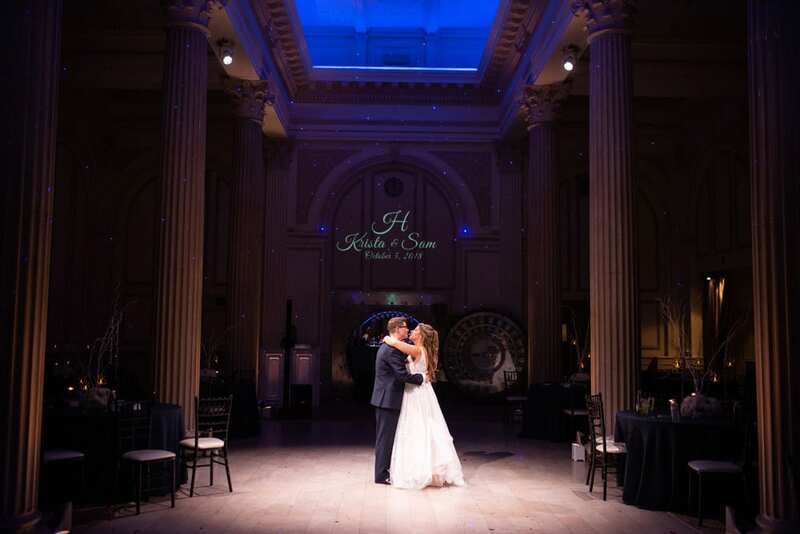 The day started out with Sam and Krista getting ready in The Treasury on the Plaza’s private suites, The Plaza Lounge and Banker’s Lounge. 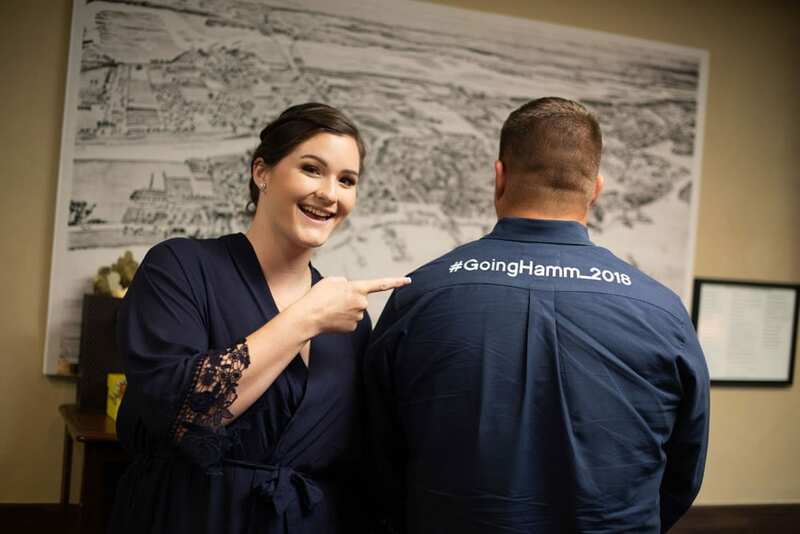 How cool is the best man’s customized shirt featuring the couple’s wedding hashtag? 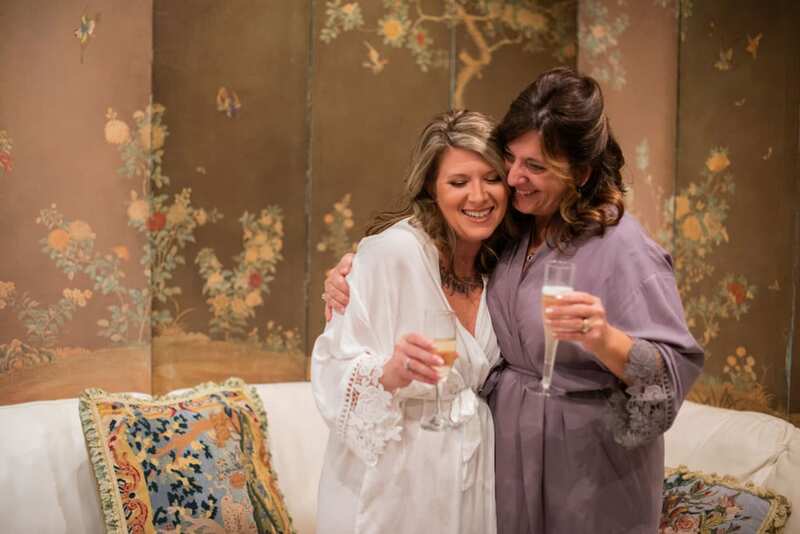 We also love the girls’ beautiful lace trimmed robes. 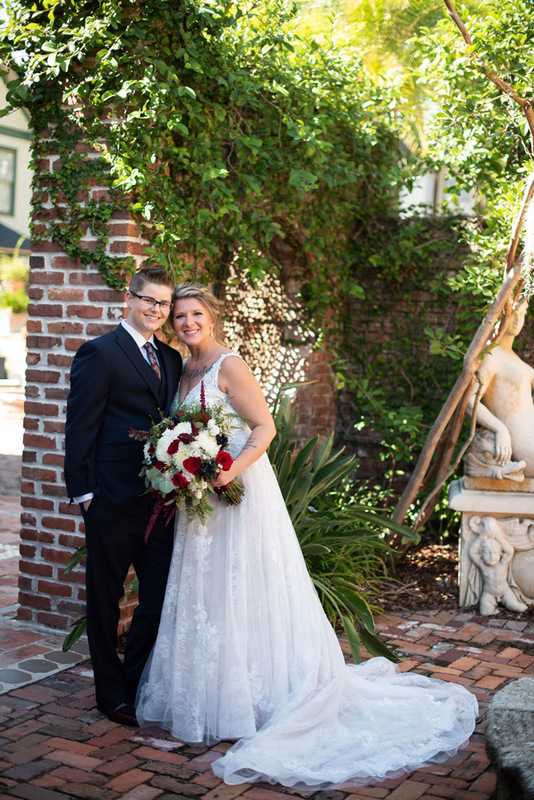 Once Krista and Sam were wedding day ready, it was time for the first look! 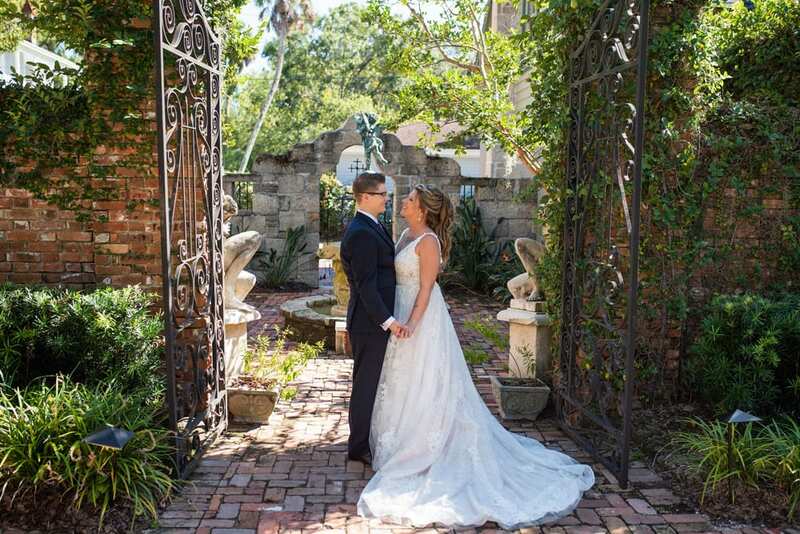 The gardens of the Collector Inn, just down the street from The Treasury, provided the perfect backdrop. 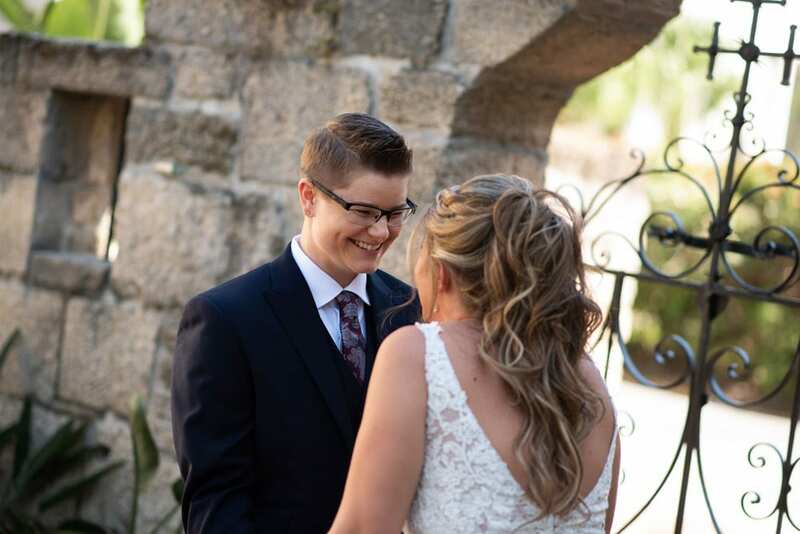 Don’t you just love how big their smiles are after seeing each other for the first time on their wedding day? 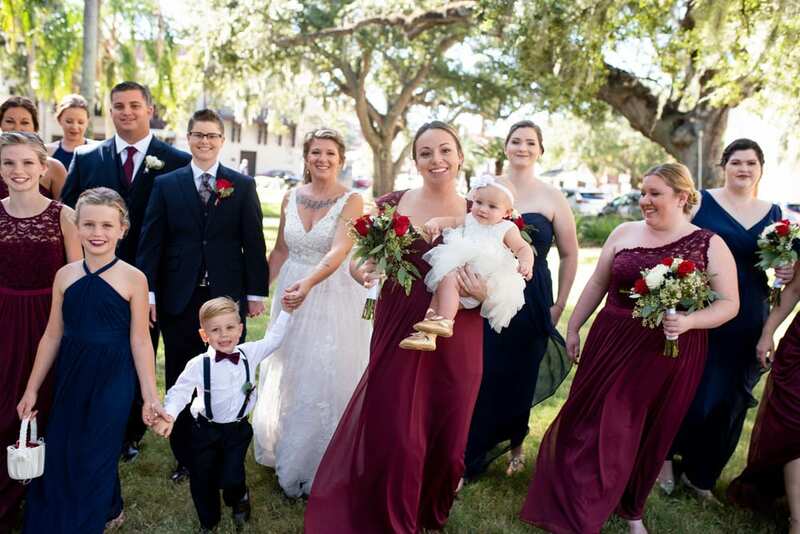 The entire wedding party joined the photo fun in the Plaza de la Constitución. 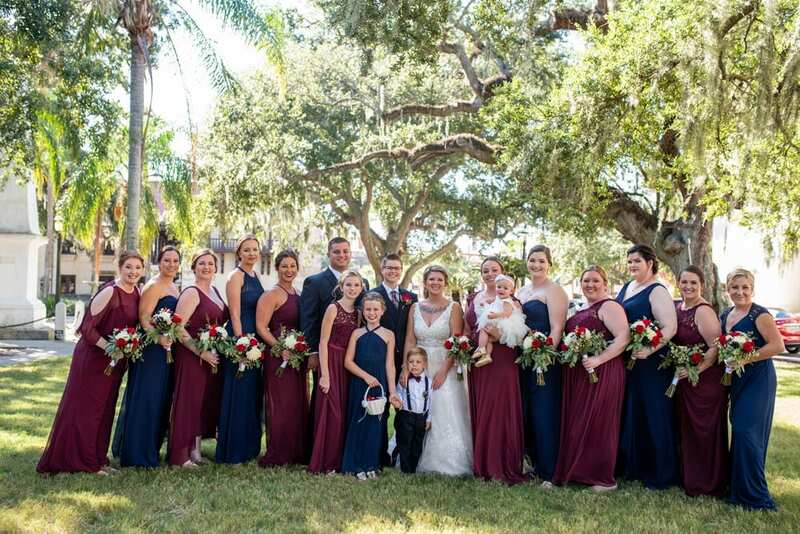 The navy and wine gowns and tuxes were the perfect color palette for a fall wedding in St. Augustine. 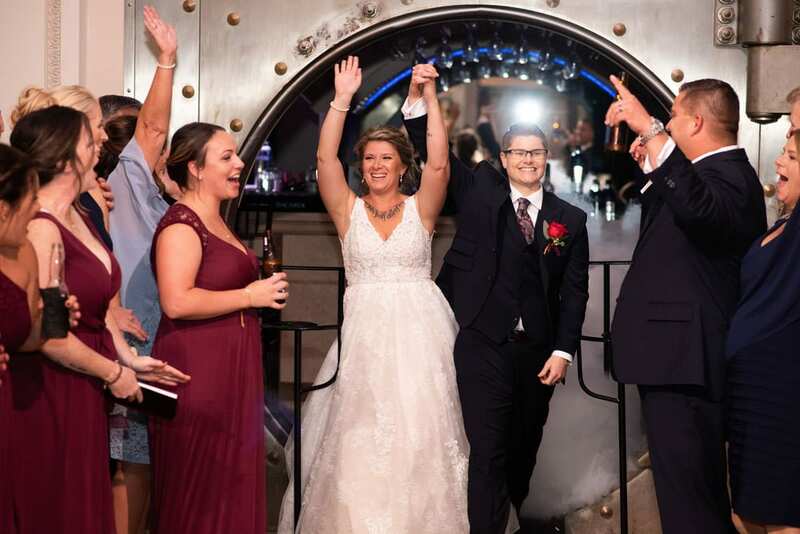 While the wedding party finished photos, guests arrived in The Treasury on the Plaza’s Grande Foyer for the wedding ceremony. 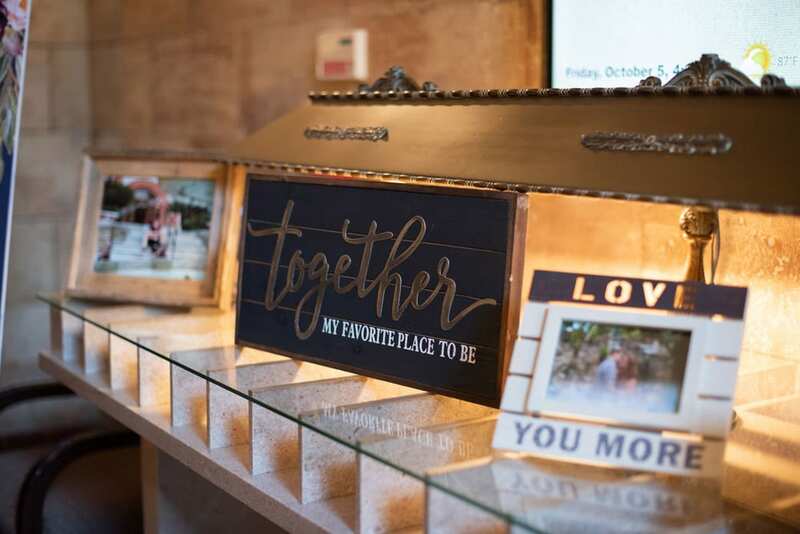 They were greeted by sweet photos of the couple and beautiful signage that carried through the navy and wine color scheme. 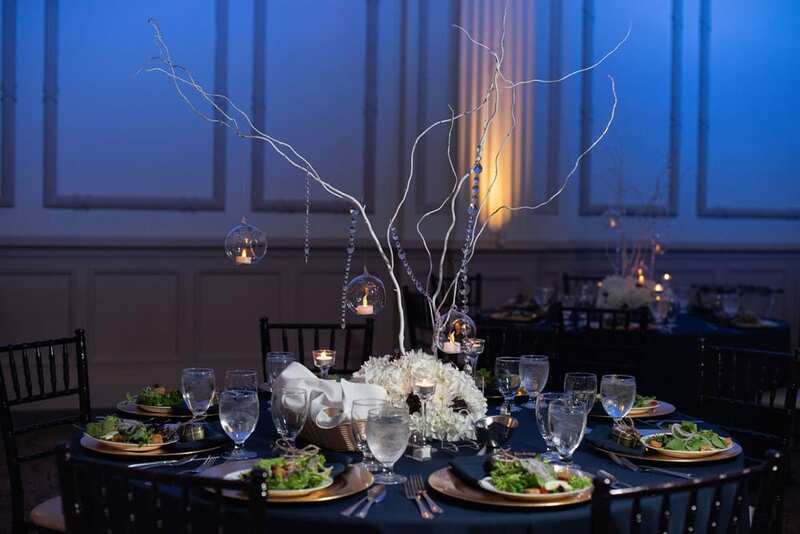 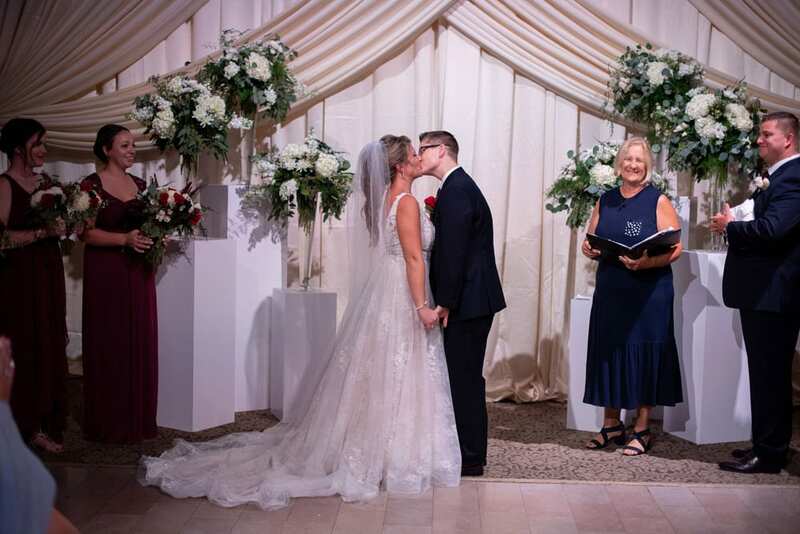 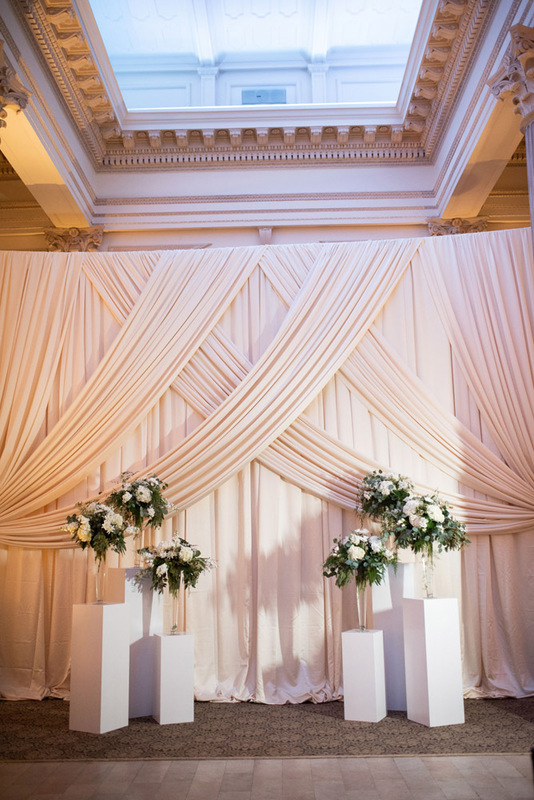 Finally, it was time to say “I do!” Mugwump Productions created an elegant wedding ceremony backdrop in The Grande Ballroom with woven pipe and drape, large pillars, and gorgeous floral arrangements. 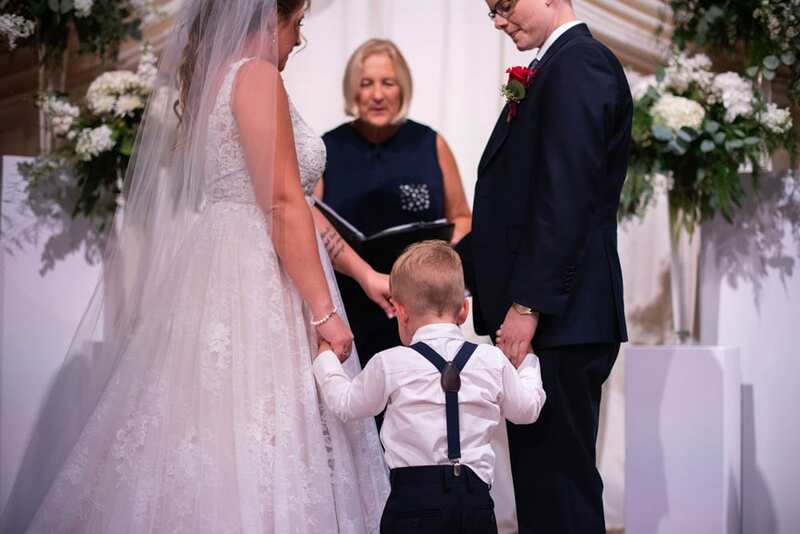 How sweet is this moment when Krista and Sam’s adorable son Porter joined them at the altar? 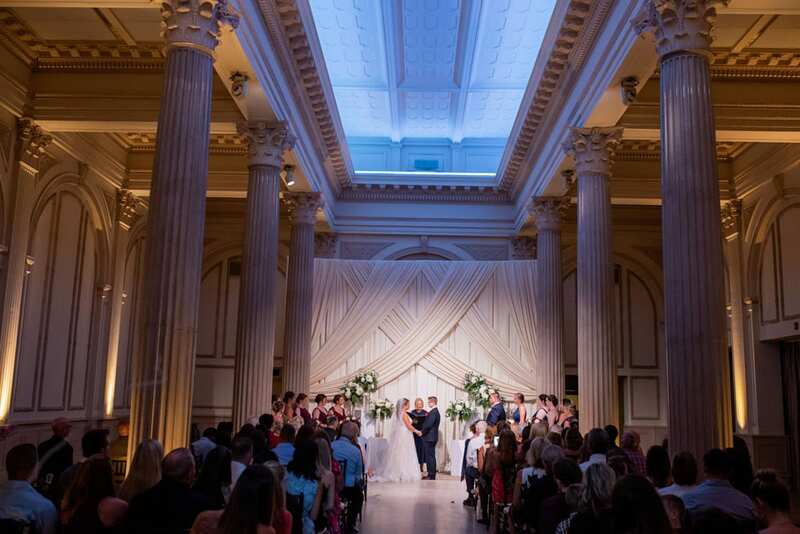 Team Treasury, along with the fabulous team of wedding vendors, quickly transformed The Grande Ballroom from the wedding ceremony into the reception while their guests enjoyed cocktails in The Exchange Gallery. 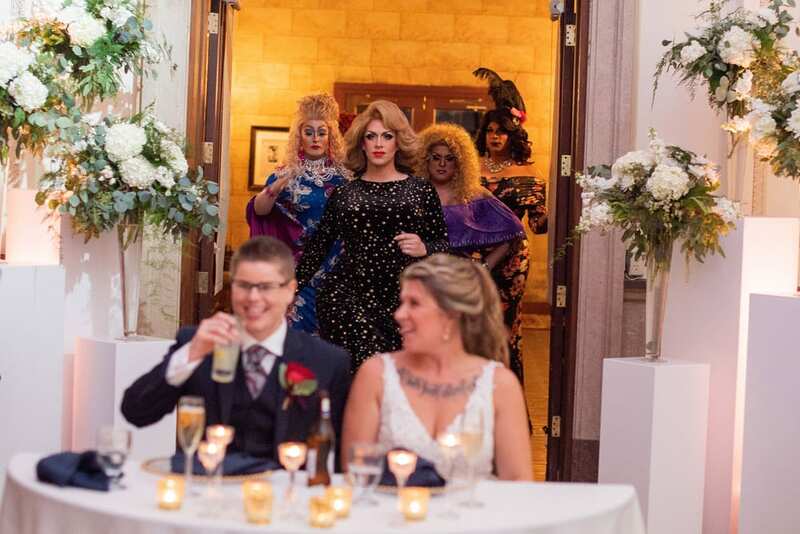 With time to spare, this allowed the new Mrs. and Mrs. to get a private sneak peek before their guests came back into the ballroom. 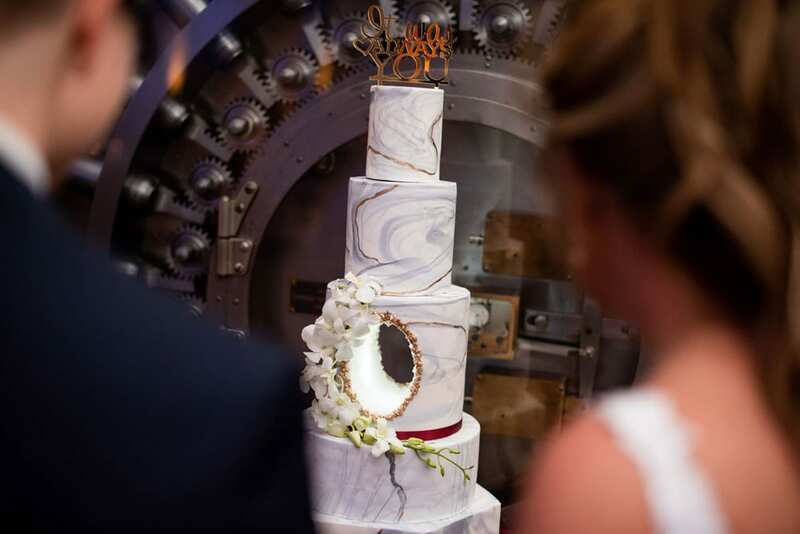 Rose Hill Cakes created one of the most unique wedding cakes that we have seen here at The Treasury! 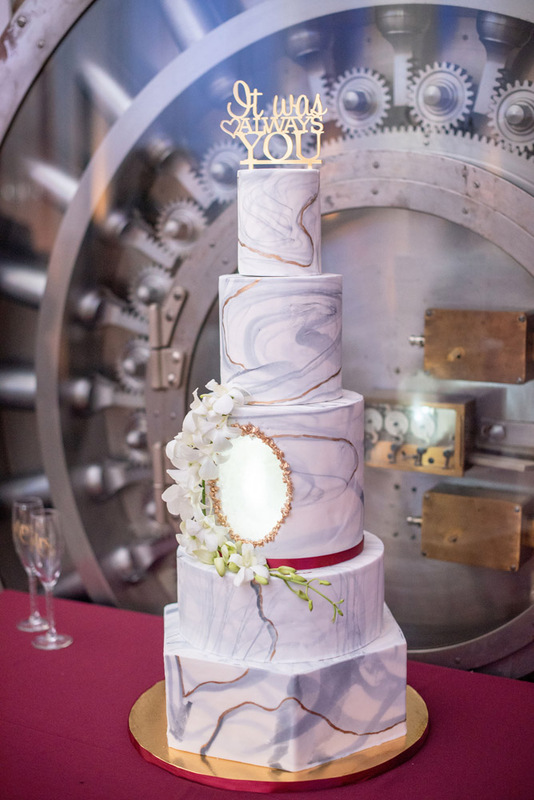 It had a glowing hole right through the middle! 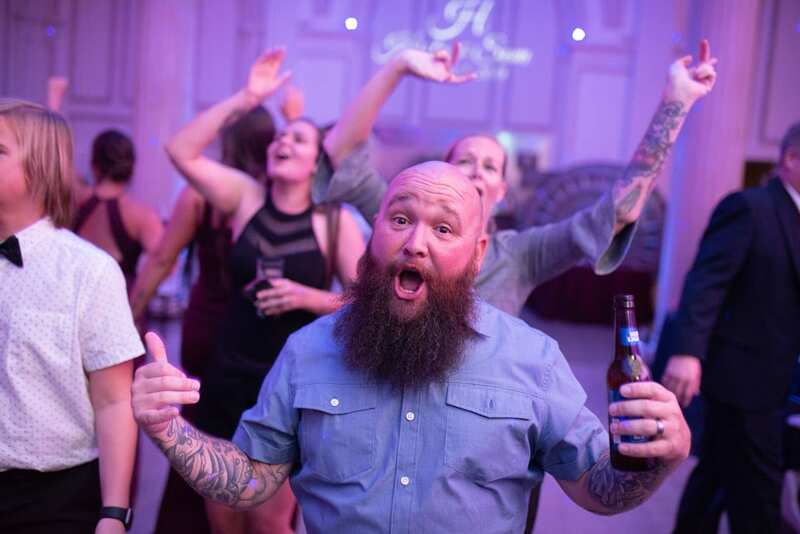 Have you ever seen anything like it?! 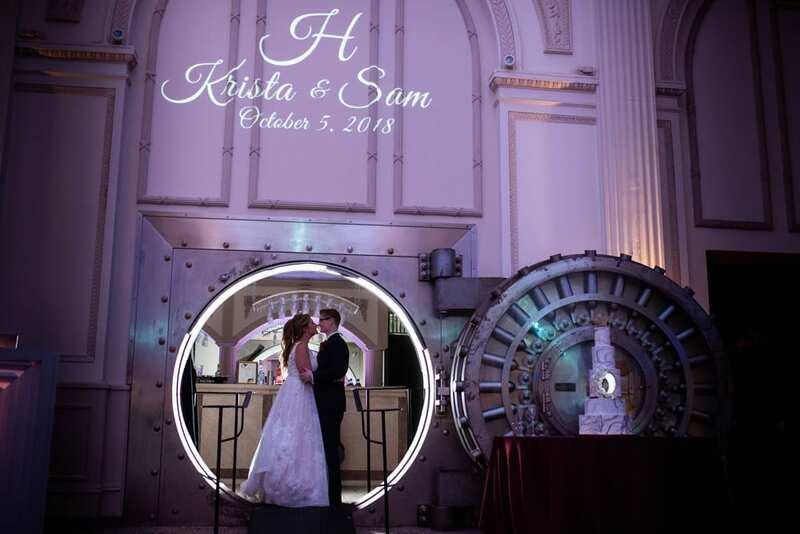 The brides got the party started with a fun reception entrance from The Vault Bar surrounded by swirling fog. 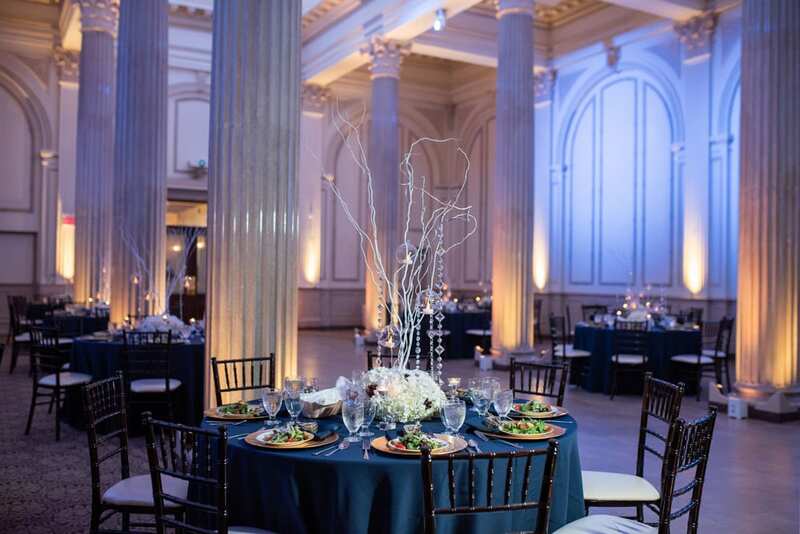 The lights dimmed and all the world faded away as they headed onto the dance floor for their first dance. 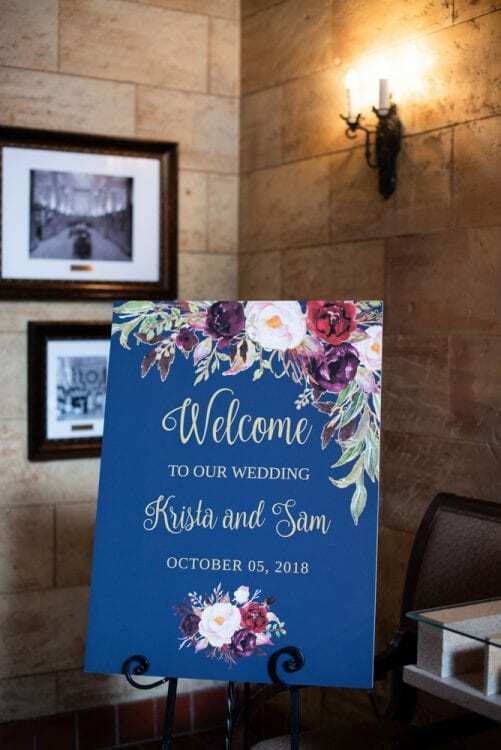 We are always on the lookout for unique wedding reception entertainment ideas, and Sam and Krista did not disappoint! 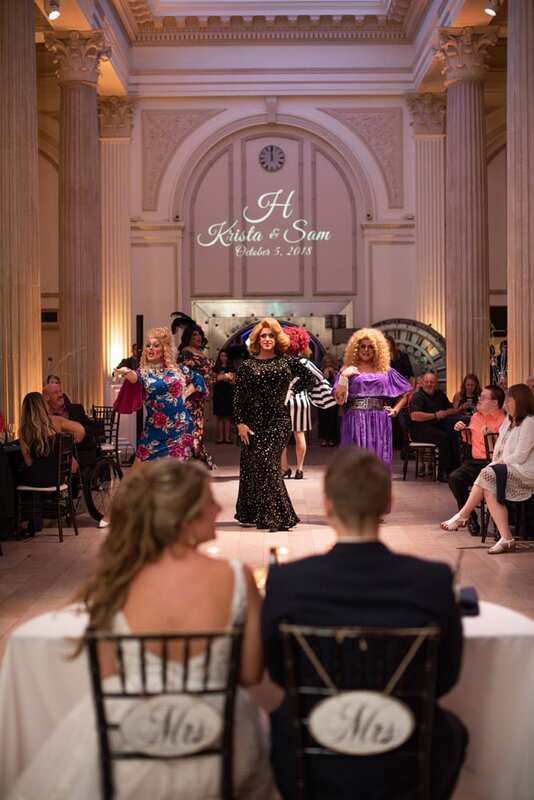 They decided to surprise their guests with a drag show!! 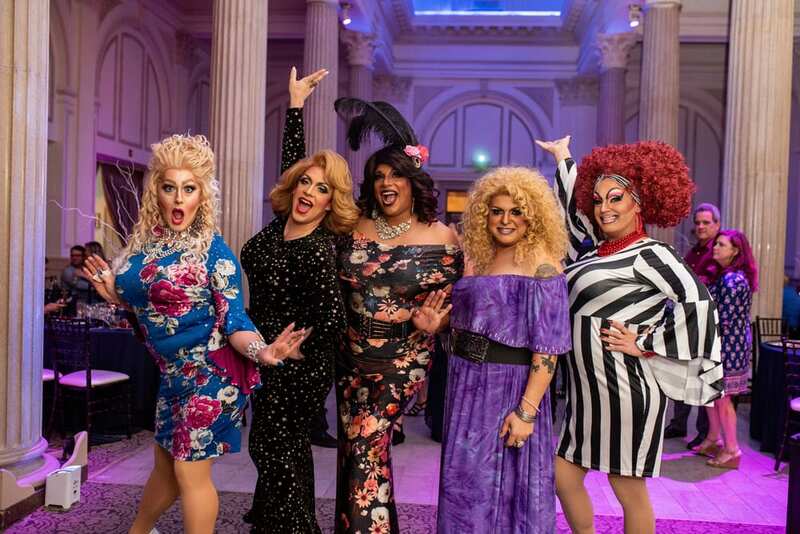 The Kissimmee Queens treated everyone in attendance to an outrageous performance that they will not soon forget. 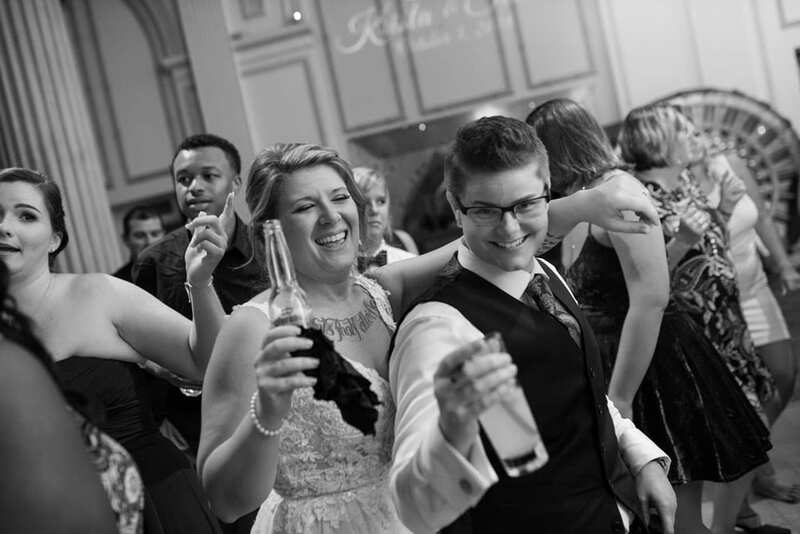 DJs Generation Y Entertainment took over from there and turned the party up to 11! 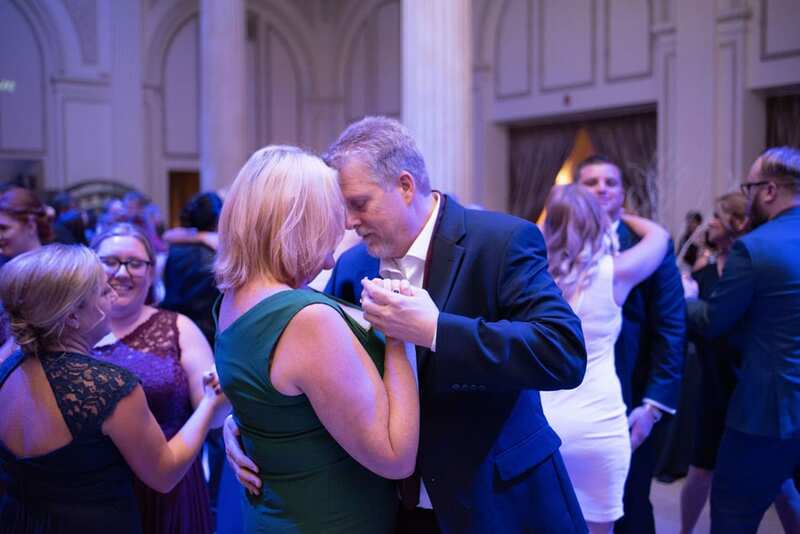 Everyone had so much fun dancing the night away. 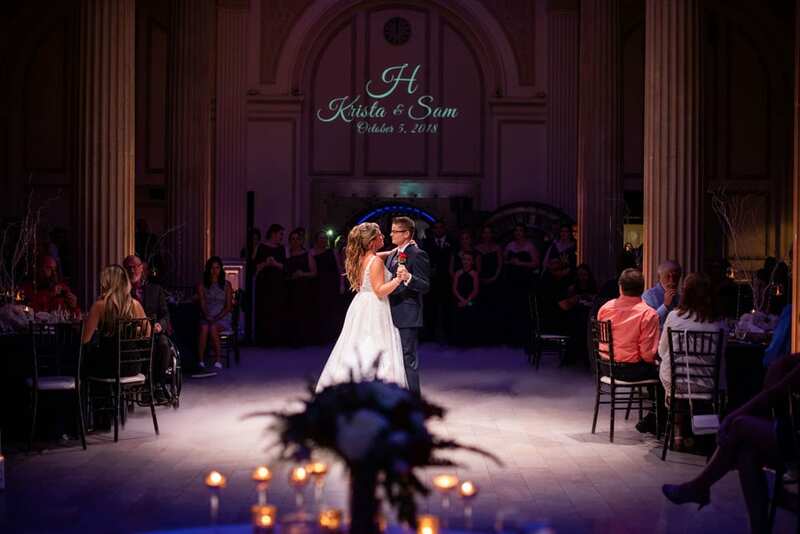 As the night wound down, Sam and Krista shared a private last dance in the middle of the dance floor. 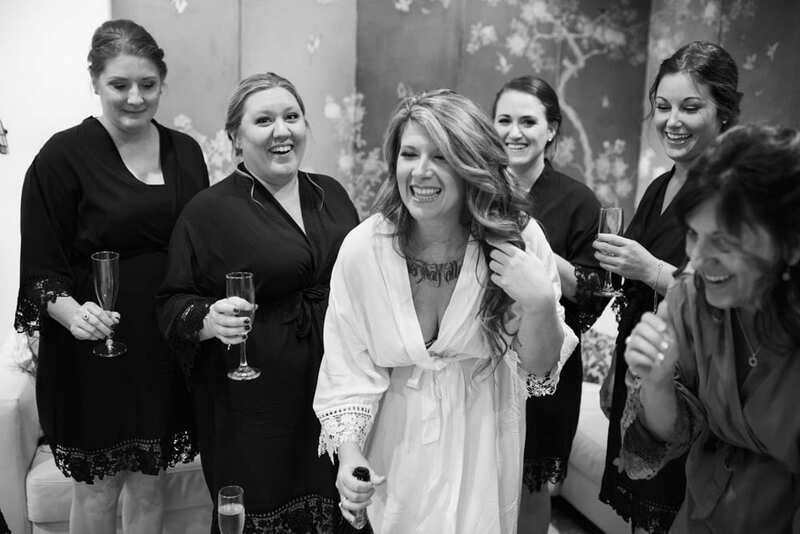 The brides had the opportunity to share in their joy, and take one final moment to reflect back on their magical day. 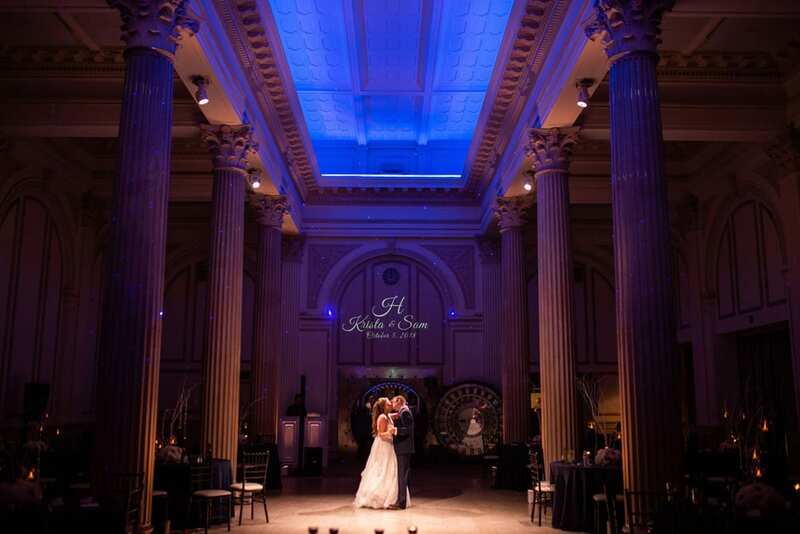 The ballroom’s Starry Night Lighting created the perfect atmosphere for this romantic moment. 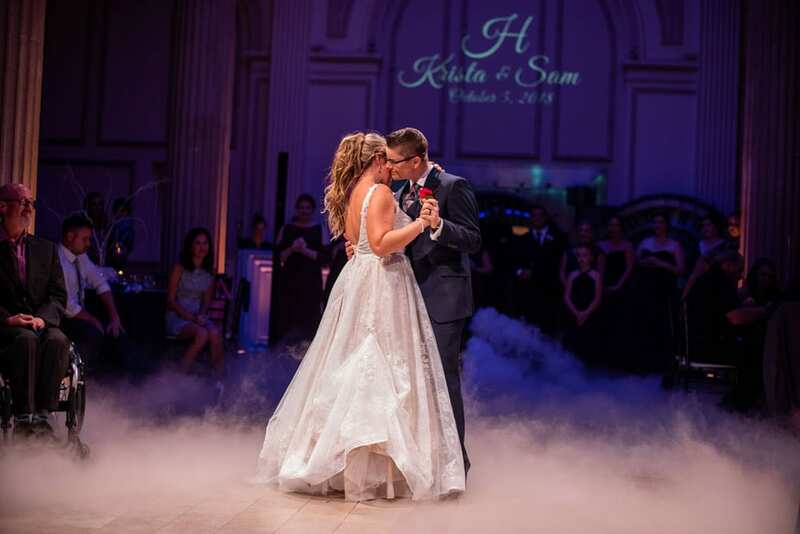 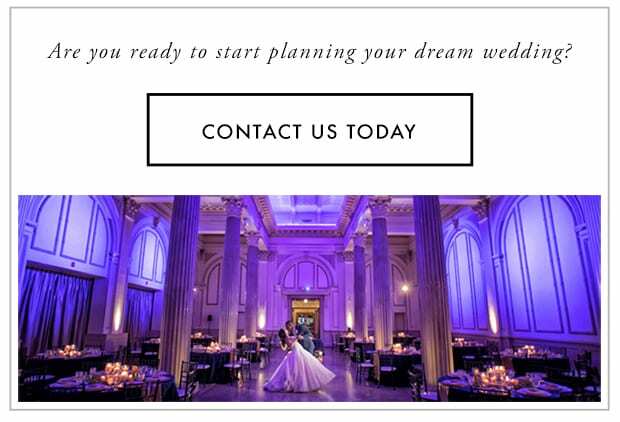 We feel so fortunate to have the opportunity to be a part of Krista and Sam’s big day. We wish you both the best in your future together!